At the turn of the last century, rhubarb growers in the area roughly between Leeds, Bradford and Wakefield in West Yorkshire produced ninety percent of the world’s rhubarb, forcing slender and pale stalks for the markets at Spitallfields or Covent Garden. The Rhubarb Express bore crates of Yorkshire rhubarb to the capital until well into the Sixties. Today, only a handful of growers remain, but the techniques are the same. Two-year old rhubarb crowns are moved into heated, darkened sheds in early winter. The heat stimulates the crown into action, and it explodes into life, pushing stalks skywards in search of light, which it never finds. This results in thin stalks, beautifully pale pink, tender and delicately flavoured. The crown is vigorous and quick to produce, growing audibly in the darkness of the sheds, snapping, popping and groaning, all of it’s energy going into the production of stalks, none into leaves. Stalks are still harvested by candlelight to avoid upsetting or distracting the crowns. 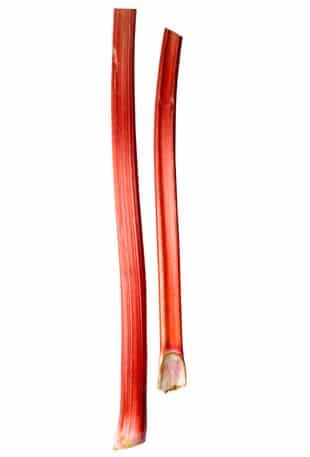 There are a number of reasons for the industrial production of rhubarb in Yorkshire, but chief amongst them is the fact that rhubarb is a native of Siberia, and likes to be cold and damp, conditions that West Yorkshire can easily replicate. Even in summer. Cheap and plentiful coal to heat the forcing sheds, and good rail links to London also helped in the development of the Yorkshire rhubarb farms. The popularity of rhubarb has come and gone over the decades. A Victorian and Edwardian staple, it fell out of favour after the Second World War as tastes developed towards more exotic – and sweeter – imported fruit. A renaissance has happened in recent years as people have rediscovered rhubarb’s sharpness and acidity. Today, sales of rhubarb, whilst nowhere near pre-war levels, are rocketing. Rhubarb crowns are astonishingly forgiving and will thrive in an unattended and unloved corner of the garden. A couple of shovelfuls of compost in winter will guarantee a decent crop. The plant produces a spray of huge leaves, ideal cover for a neglected bed or corner, and is easy to care for. Just remember the compost every year and pull whatever stalks you need until July. Any stalks left after July are for the plant and help it to gather it’s strength for the next year. The classic culinary use for rhubarb is in a crumble. Gently stew rhubarb chopped into two or three centimetre chunks with a splash of water or orange juice, with sugar added to taste. The cutting acidity of the rhubarb must be preserved, so be careful with the sugar. Top with a simple crumble, made with 160g of plain flour cut with about 110g of diced butter, with maybe 25g of sugar added. Cook in a hot oven for twenty-five minutes and eat hot, maybe with cream or yoghurt. To me, there is no finer crumble, and no better way to eat rhubarb. Having said that, it’s a versatile ingredient, and sits well next to oily fish such as mackerel, and it’s also delicious stewed simply in a little orange juice and served as a compote.